It is not clear if early oral contraceptive use increases the risk of breast cancer among young women with a breast cancer susceptibility gene 1 (BRCA1) mutation. Given the benefit of oral contraceptives for the prevention of ovarian cancer, estimating age-specific risk ratios for oral contraceptive use and breast cancer is important. We conducted a case–control study of 2,492 matched pairs of women with a deleterious BRCA1 mutation. Breast cancer cases and unaffected controls were matched on year of birth and country of residence. Detailed information about oral contraceptive use was collected from a routinely administered questionnaire. Conditional logistic regression was used to estimate the odds ratios (OR) and 95 % confidence intervals (CI) for the association between oral contraceptive and breast cancer, by age at first use and by age at diagnosis. Among BRCA1 mutation carriers, oral contraceptive use was significantly associated with an increased risk of breast cancer for women who started the pill prior to age 20 (OR 1.45; 95 % CI 1.20–1.75; P = 0.0001) and possibly between ages 20 and 25 as well (OR 1.19; 95 % CI 0.99–1.42; P = 0.06). 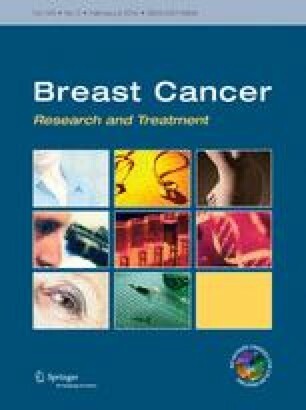 The effect was limited to breast cancers diagnosed before age 40 (OR 1.40; 95 % CI 1.14–1.70; P = 0.001); the risk of early-onset breast cancer increased by 11 % with each additional year of pill use when initiated prior to age 20 (OR 1.11; 95 % CI 1.03–1.20; P = 0.008). There was no observed increase for women diagnosed at or after the age of 40 (OR 0.97; 95 % CI 0.79–1.20; P = 0.81). Oral contraceptive use before age 25 increases the risk of early-onset breast cancer among women with a BRCA1 mutation and the risk increases with duration of use. Caution should be taken when advising women with a BRCA1 mutation to take an oral contraceptive prior to age 25. Please refer the Appendix section for the other members of the Hereditary Breast Cancer Clinical Study Group. We would also like to acknowledge the study coordinators Adriana Valentini, Marcia Llacuachaqui, and Alejandra Ragone, as well as the students and staff Jennifer Ng, Kristi De Buono, Kate Bisnaire, Dina Nikitina, Anneli Loo, Bita Khorram, Dina Gordon, Courtney May, Michelle Jones, Jose Miguel Lozano, who helped with the data collection and data entry. Joanne Kotsopoulos is the recipient of a Cancer Care Ontario Research Chair in Population Studies and a Canadian Cancer Society Career Development Award in Prevention. Charis Eng is the recipient of the Sondra J. and Stephen R. Hardis Chair of Cancer Genomic Medicine at the Cleveland Clinic and of the ACS Clinical Research Professorship. Susan L. Neuhausen is partially supported by the Morris and Horowitz Endowed Professorship and her work was supported by a grant from the NIH, R01CA74415. Tuya Pal’s work is supported by a grant from the Florida Biomedical Research Program, IBG-09. Steven Narod is the recipient of a Canada Research Chair tier I.
Mary Daly, Taya Fallen, Albert Chudley, John Lunn, Talia Donenberg, Raluca N. Kurz, Jeffrey Weitzel, Howard Saal, Susan Friedman (on behalf of FORCE), Judy Garber, Gad Rennert, Kevin Sweet, Ruth Gershoni-Baruch, Christine Rappaport, Edmond Lemire, Dominique Stoppa-Lyonnet, Olufunmilayo I. Olopade, Sofia Merajver, Louise Bordeleau, Carey A. Cullinane, Eitan Friedman, Wendy McKinnon, Marie Wood, Daniel Rayson, Wendy Meschino, Jane McLennan, Josephine Wagner Costalas, Robert E. Reilly, Susan Vadaparampil, Kenneth Offit, Noah Kauff, Jan Klijn, David Euhus, Ava Kwong, Claudine Isaacs, Fergus Couch, Siranoush Manoukian, Cezary Cybulski, Tomasz Byrski, Seema Panchal, Susan Armel, Rochelle Demsky, Sonia Nanda, Kelly Metcalfe, Aletta Poll, Barry Rosen, William D. Foulkes, Timothy Rebbeck, Peter Ainsworth, Andre Robidoux, Ellen Warner, Lovise Maehle, Michael Osborne, Gareth Evans, Barbara Pasini, Ophira Ginsburg, Stephanie Cohen, Gorski Bohdan, Anna Jakubowska and Janice Little.